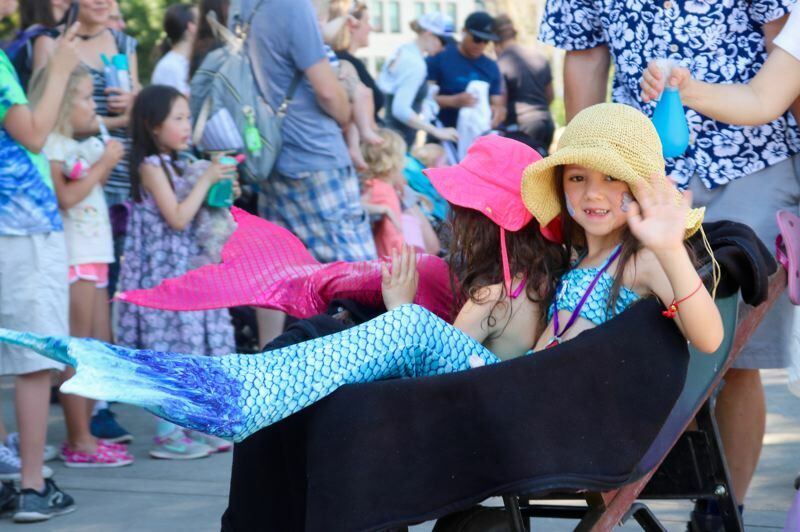 Hundreds gather at Tom McCall Waterfront Park on July 28 for third-annual merpeople celebration. 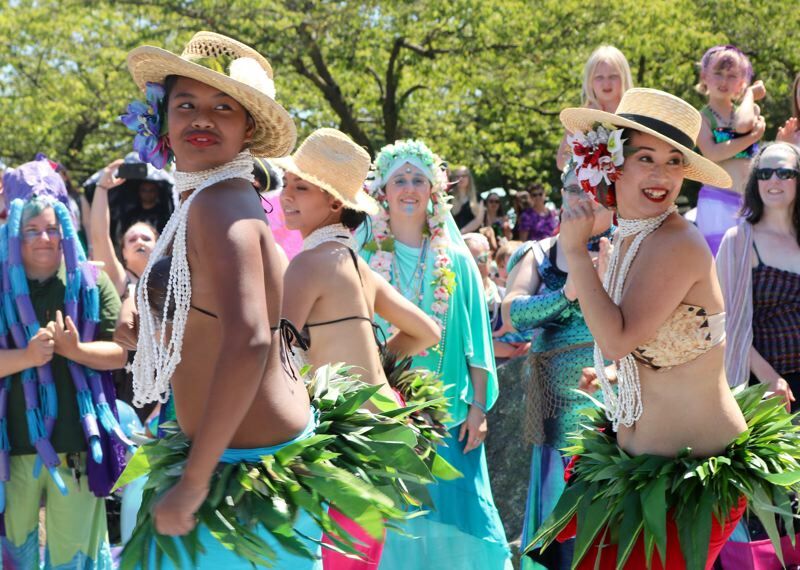 It was Princess Ariel — star of "The Little Mermaid" — who asked that question, but the answer was on the lips and in the hearts of all the aquatic creatures that walked, flopped and rolled along during the third-annual Portlandia Mermaid Parade. 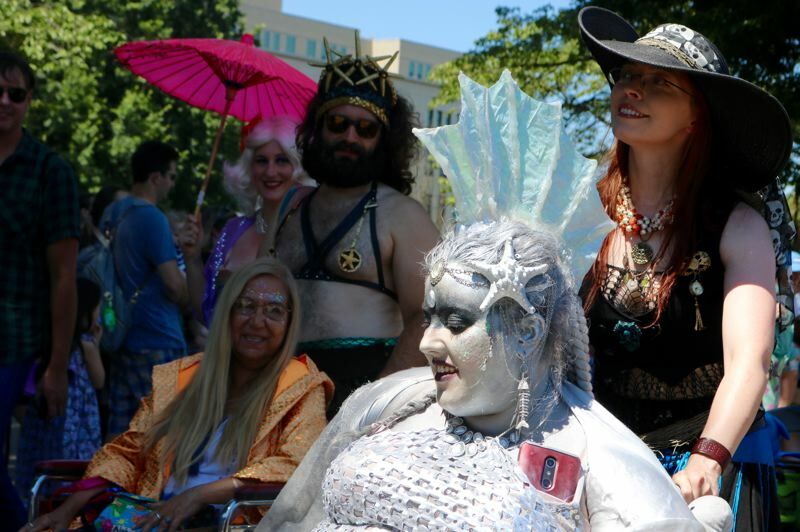 Dreams do come true — and hundreds of parade-goers at the Saturday, July 28 march in downtown Portland had the scales to prove it. "It's all about finding your own persona and telling your own story," explained Ylluria WaterSong, who like many in the community uses a nom de mer. "I'm visually impaired and I could swim before I could walk, so the water has always been home to me." WaterSong has been a professional mermaid for the last five years, which means she "entertains people in tail" on both land and water. Her elaborate costume involves silvery face paint, a starfish pinned like a bow, plus a webbed mohawk shaped like a spiny dorsal fin. 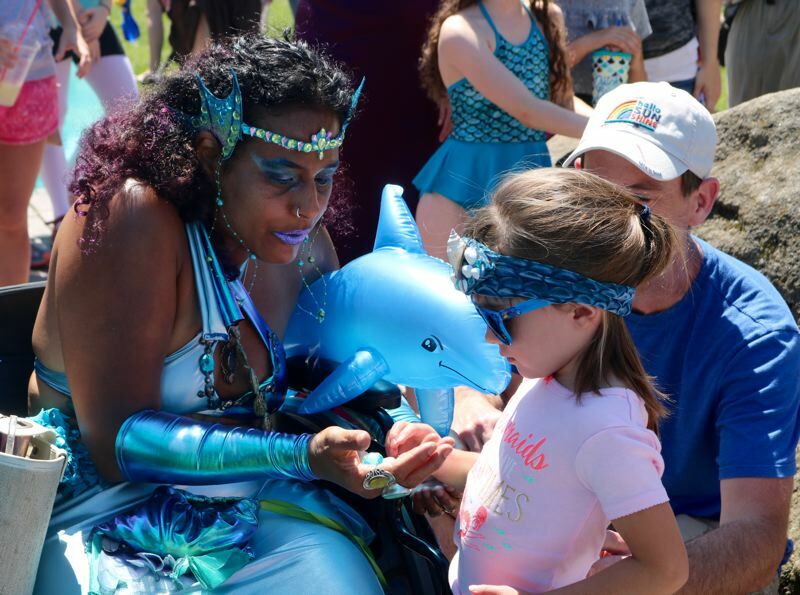 She touts the Mermaid Parade's family-friendly, all-inclusive environment, though she says men have a harder time getting all of their body parts into the bottom half of the costume. "It's true, you've got to learn how to tuck," a passerby commented. Chris Guerrero of Beaverton is a proud member of the merman minority. 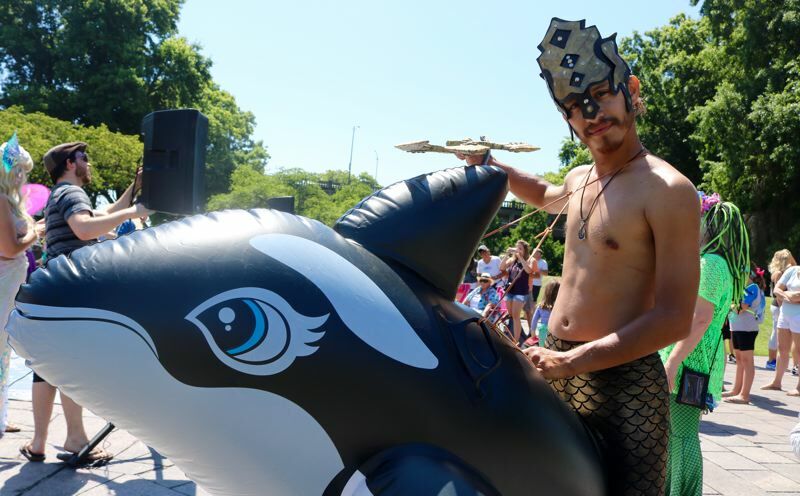 Armed with a trident and clad in a golden faceplate, the 30-year-old repurposed an inflatable orca as his mount. He claims the costume only took "five minutes" to make, and that the hardest part was rigging up a harness to keep the killer whale in place. "It's a great way to get outside and show people that Portland can still be weird," he said. Part of the reason Guerrero participates is to model for children how men, too, can enjoy dressing up and becoming someone else. "Everyone talks about mermaids," he sighed. 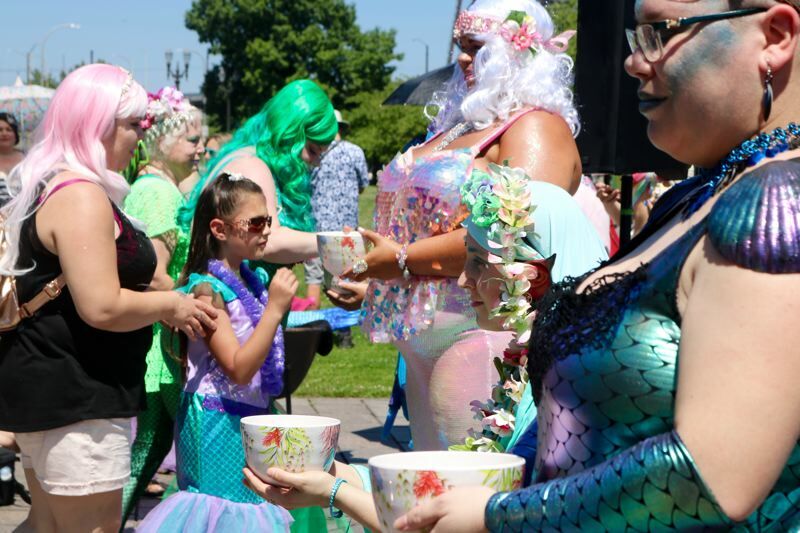 With about 200 attendees and nearly twice as many onlookers, the Portlandia Mermaid Parade kicked off with an invocation to the elements, then organizers passed out seashells and encouraged the crowd to put their hopes and frustrations into them. The shells were let loose into the Willamette River once the marchers reached Poets Beach, and the crowd was assured that the merpeople would be listening. But first, the parade made its way past the Portland Saturday Market and the Oregon Brewers Festival while tromping along the Waterfront Trail from a starting point at the Japanese American Historical Plaza in Tom McCall Park. Serving as grand marshal was the nonprofit Magic Wheelchair, which decorates mobility devices for children. "When I see people in their costumes, it's kind of like they're showing off their creativity," said Skyler Brown, 11 and one-half, who was also dressed up. "I think they're very beautiful. They just get to swim in the water and see all the creatures."